I’ve always thought running was a perfect fitness activity. Grab some shoes and go – what could be easier? But every time I’ve tried, I’ve burnt out pretty fast. Huffing and puffing, with a stitch in my side, it was miserable. Thanks to the discovery of the “C25K” program, I’ve now completed my 2nd week of running regularly. It’s a walk/jog interval program and with the help of podcasts that signal when to change pace, I think I’ve found a way to get to that 5k. Go Tricia! Maybe I should look into the couch to 5k again. Keep going! I did a couch to 5K program a few years ago and have been running ever since. I remember I had to redo some of the weeks because I wasn’t able to progress as fast as the program prescribed. But I’m really glad I put up with it because it really does work. And once running gets in your system, it is really hard to give it up. 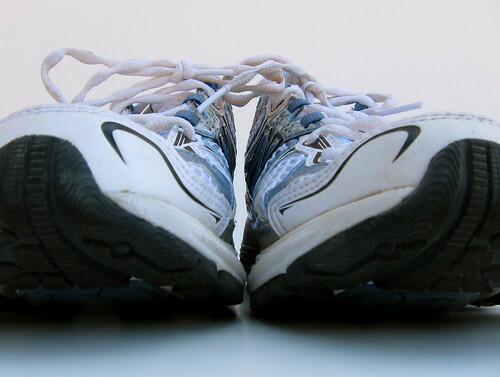 Make sure you’ve got a good pair of running shoes & that you stretch after your workout. Go Tricia and good luck!